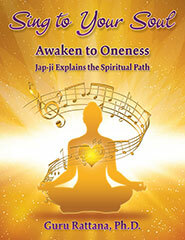 In this e-version of Sing to Your Soul, Guru Rattana, Ph.D., provides a comprehensive introduction to the ancient spiritual text of Jap-Ji, a text that reaches out to us all to awaken to our oneness, regardless of our spiritual path, class or creed. Meaning sing to your soul, it was first recited by Guru Nanak (1469-1539), initiator of the Sikh path, after a spiritual awakening. It was originally written in the language of the gurus - Gurumukhi. Its recitation offers a formula for achieving higher consciousness and will awaken the mind to an experience of the Infinite. Just listening to its universal message every day is spiritually beneficial.